At Maserati Alfa Romeo of Daytona, you’ll find an extensive selection of new and pre-owned Maserati and Alfa Romeo. In addition, we carry many other high quality, low mileage, pre-owned luxury vehicles from the world’s leading premium brand luxury auto manufacturers including, BMW, Lexus, Infiniti, Mercedes Benz, Nissan, Jaguar, and many other major high-end brands. If you want the luxury of selection, you want to begin your search at Maserati Alfa Romeo of Daytona. We assure you that your search will be a quick one thanks to our copious new and pre-owned inventory. Maserati Alfa Romeo of Daytona prides itself on setting the standard for car dealerships in Naples and the entire Central Florida area by taking customer service to the next level. Our sizeable selection boasts a wider variety of new and used cars than almost any other Maserati & Alfa Romeo dealer in the area. We have new Maserati’s and pre-owned car inventory arriving daily, so you are sure to find just what you are looking for here at Maserati Alfa Romeo of Daytona, the Maserati & Alfa Romeo retailer that stands apart from all other Maserati & Alfa Romeo dealers from Titusville to Jacksonville and all over the Palm Coast. 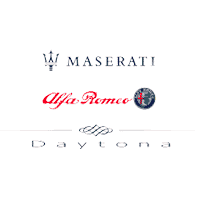 Maserati Alfa Romeo of Daytona uses a winning formula to remain the Maserati & Alfa Romeo retailer of choice on the Palm Coast, in Central Florida and even as far as Cocoa Beach. That formula combines superlative selection plus competitive prices plus first-class customer service. The result is satisfied customers from the moment they arrive to when they leave in their new vehicle, and all throughout their Maserati Alfa Romeo of Daytona ownership experience. Maserati Alfa Romeo of Daytona knows that in order to stay the premiere Maserati Alfa Romeo of Daytona and the surrounding areas we have to keep customers pleased with us now as well as in the future. We realize that you are our best ambassadors to the community so we want to make sure you stay satisfied. Apparently, our formula is working as we proudly serve customers from Jacksonville, St Augustine, Melbourne, Orlando, Tampa and surrounding in areas in Central Florida.